Clear, youthful, healthy skin is something that every woman wants to have – pretty much from the time of her first zit to her first laugh line and beyond. We’ll cover up wrinkles with make-up, put on green masks, and not make funny faces (or else it’ll freeze that way) all for the sake of not doing anything to reveal any blemish. But really, healthy skin is more than just quick fixes. It’s about treating the root of the ‘problem’. And while we can’t turn back the clock, there is a system out there that specifically targets the sources of aging that can make our skin look older. ageLOC science from Nu Skin targets not only the signs of aging, but also the SOURCES of aging by identifying groups of genes – Youth Gene Clusters – that can regulate how we look as we age. ageLOC science supports resetting these Youh Gene Clusters to their youthful patters of activity and incorporates this science into the development of Nu Skin products. 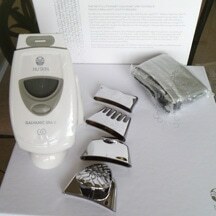 There are two elements to the Nu Skin skincare system. A topical face care regime that cleanses, protects, and nourishes the skin and a complete at-home spa system that uses electric current to delivery product deep down into your skin. I absolutely love the ageLOC Gentle Cleanse & Tone cleanser. 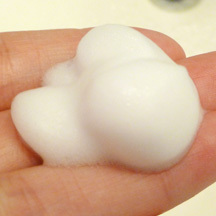 It’s a gentle, foaming cleanser that smells like fresh linen. It rinses off easily and cleanly without leaving a residue. Some cleansers immediately make my face feel try and stripped of healthy oils. The ageLOC Gentle Clenase & Tone cleanser just left my face feeling fresh. The bottle says that you should use three pumps of foam, but I’m a conservationist (sort of) and only used two pumps without any problems. After cleansing, I followed up with the Future Serum and then either the Radiant Day or Transforming Night creams. 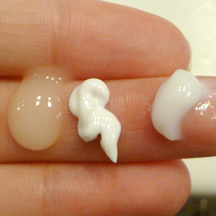 (In the photo, the serum is on the left, radiant day cream in the middle and night cream on the right.) I pictured the serum as the foundation – coating the skin with nourishing ingredients, and then the other two as an additional outer layer that helps protect it from the sun while also providing additional moisture. The Future Serum itself is fairly lightweight with a light fragrance. It rubs into the skin very easily after washing. The Radiant Day is a little thicker – which I attribute to the SPF 22, which protects against UVA and UVB sun damage. The Transforming Cream is very light and you can just tell that it’s a great moisturizer, but it doesn’t weight on the skin at all. From face wash to serum to moisturizer, I can finish the entire system in just a couple of minutes. The combination of these protects has truly provided me with clearer and more youthful skin. But I’m not alone. A third-party study demonstrated that people who used ageLOC Transformation twice a day for 12 weeks say improved signs of aging in just seven days and an improvement in fine lines, skin smoothness, and radiance after 12 weeks. Based on my own experience, these results are 100% believable. The spa system consists of the hand-held spa itself, or the ingredient delivery mechanism as I like to think of it, and head attachments. There are four products that can be used with the ageLOC Edition Galvanic Spa System II – ageLOC Galvanic Spa Facial Gels, Tru Face Line Corrector, Galvanic Spa II Body Shaping Gel, and Nutriol Hair Fitness Treatment. Each treatment uses it’s own head attachment, which is included in the spa system. Each treatment also has it’s own special treatment setting on the spa. I tested out the Galvanic Spa Facial Gels with ageLOC. This consists of a two step treatment where you apply a pre-treatment gel using spa setting 1 and then follow wih the actual treatment at setting 2. It’s recommended that this treatment is used 2-3 times per week. According to NuSkin, “the negatively charged Pre-Treat Gel binds to impurities, softens and relaxes pores allowing them to breathe and dissolves excess facial oils. The positively charged ageLOC Treatment Gel draws out impurities targeted in the pre-treat step, facilitates recovery from stress, enhances hydration and targets the ultimate sources of aging to help preserve the look of youth and reduce the overall appearance of aging.” According to me, after ONE treatment those lines that I’ve been pretending aren’t there…you know, the thin lines around the eyes and between the brows, were SIGNIFICANTLY diminished. To the point where when one of my friends saw me later that day, the commented on how my face looked brighter. The actual spa experience is actually rather different. Other systems have you lather on a cream, let it sit, and then rinse off. Here you play a more active role in ensuring that the product gets worked into the skin through the galvanic currents. You put the treatment on, then wet your fingers and press them against the conductive pad on the back of the spa. Put the spa up to your skin so it can calibrate. 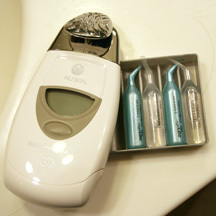 Once it beeps that it’s ready, you slowly move the spa over your face. I definitely felt a warmth as the spa moved across my face. It didn’t feel like a current or hurt, it was just extra warmth. Incidentally, you can only use this product on yourself. I tried holding the spa system while treating someone else and it broke the current loop. So the person who is receiving the treatment also needs to be holding the spa system. A fellow tester was the guinea pig for the Tru Face Line Corrector. 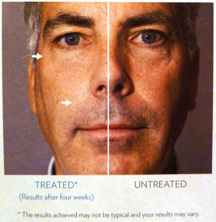 This product promises to “reduce the appearance of moderate to deep lines by sending age reversing signals to collagen-producing cells.” NuSkin has amazing before and after shots that show a definite change in their test subjects. We tested the corrector specifically on the forehead lines and the lines around the mouth. Once again the results were immediate and very apparent with the depth of the lines appearing much shallower (not as deep) – especially around the mouth. 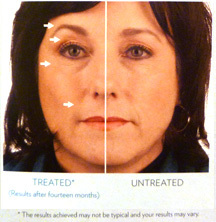 We kept looking in the mirror commenting on how the tester looked more youthful after just the first treatment. I will acknowledge that the ageLOC Transformation and Edition Galvanic Spa System II are more expensive than what you can get in the grocery story. But in this case, I believe you get what you pay for. Also remember that many times facial spa treatments themselves can cost over $100 for a good treatment. Instead of going out for the facials, you’d instead be investing that into the ageLOC Galvanic Spa System II so you can treat yourself at home. Visit www.ageloc.com and leave a comment one thing you learned or like about ageLOC or the ageLOC product you want to try the most. Giveaway ends at 11:59 PM EST, February 5, 2011. NOTE: This giveaway is open to US and Canada Residents. I learned that the company has been around for 26 years. I’d like to try the AgeLoc Future Serum. Like WIC project on FB. I would love to try AGELOC Future Serum! I like the Ageloc Future Serum because its anti-aging ingredients stimulate youthful cell renewal by 85% in only five days and 150% over time. Thanks! I’d like to try the AGELOC™ TRANSFORMING NIGHT cream. The Ageloc Future Serum would be something I am interested in. I like the fact that there products are dermatologist approved and not animal tested. Based on this discovery, Nu Skin is able to identify critical arSuperMarkers called Youth Gene Clusters, which are functional groups of genes that regulate how we appear to age. Only ageLOC ’s proprietary science understands how to reset these Youth Gene Clusters to their youthful patterns of activity. wow – I’m 41 and fighting cancer – could really use this product! in Nu Skin’s 25-year history with $1.25 billion in sales! I like the WIC Project on FB as Danielle P.
softens and relaxes pores allowing them to breathe and dissolves excess facial oils. Something interesting for me was that Nu Skin is able to identify critical arSuperMarkers called Youth Gene Clusters, which are functional groups of genes that regulate how we appear to age! I learned that ageLOC takes the science of anti-aging to a completely new level by studying the genetic origins of how and why we age. I’d like to try the Future Serum BADLY. This technologically promotes healthy and abundant looking hair. This is what I am looking for: the look and feel of more abundant hair. I was impressed by the self-perception after 12 weeks of use. Up to 73% better hydration, toning, etc… Would love to try it. By 2015, the anti-aging industry will grow by 76%. I would love to try AGELOC Future Serum! Sounds great. I would love to try the day cream! SPF 22! I’d love to try the Transforming Night product. I like you on Facebook and subscribe on twitter. I would like to try the AgeLoc Transformation Night Serum. I really like that there is alot of science based on how skin ages behind these products. I am following the WIC project on Twitter. I want to try the Ageloc Future Serum! I most want to try the Ageloc Future Serum. I would really like to try the ageloC™ Future Serum. I’d like to try the Radiant Day SPF 22. Thanks! the ageloc serum looks amazing!!!! I’d like to try AGELOC Future Serum! subscriber to The WiC Project via email and confirmed too. Nu Skin is able to identify critical arSuperMarkers called Youth Gene Clusters, which are functional groups of genes that regulate how we appear to age. I’d like to try the ageloC Gentle Cleanse & Tone. Thanks. I learned…Developed by Nu Skin in collaboration with leading scientists, ageLOC science is based on the discovery of internal sources of aging that contribute to an aging appearance, what Nu Skin calls age-related super markers, or arSuperMarkers. They’re planning on offering a nutritional line as well. I subscribed to The WiC Project via email address news(at)telus(dot)net. The one thing I really like about Ageloc is that their products are scientifically validated. I can be sure that I am getting a great product that really works. I have joined The Wic Project’s email list using [email protected]. 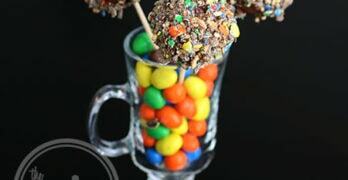 I am following on Twitter (@bullittmilner) and am a fan on Facebook (Pauline Milner Pike). I like to try the RADIANT DAY SPF 22. I learned that Nu Skin is taking the science of anti-aging to a completely new level by studying the genetic origins of how and why we age. I like the face that it improves the condition of the skin! Could not resist sharing this giveaway on FB with my friends. Nu Skin is able to identify critical arSuperMarkers called Youth Gene Clusters, which are functional groups of genes that regulate how we appear to age. Only ageLOC ’s proprietary science understands how to reset these Youth Gene Clusters to their youthful patterns of activity. I would like to try the ageloC Future Serum. the transforming night would be nice to try. no animal testing is a plus too. I visited the site and read about how they use genetic science to keep skin looking young. I’d like to try the future serum. I learned that this line was launched in October of 09 and that by 2015 the market for this will be up 76% in US! Wow! 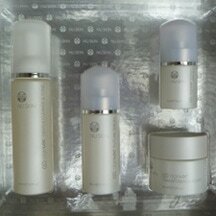 Visited http://www.ageloc.com and would love to try the AgeLoc Transforming Night! I learned that they used real research and found arSuperMarkers—the ultimate sources of aging that can influence how we age. I would like to try the ageLOC™ Elements product. learned: Their first global product offering under the ageLOC brand, the ageLOC skin care products, launched at Nu Skin’s global convention in October 2009. I learned that Nu Skin has created an exclusive partnership with the founders of LifeGen Technologies, providing access to more than 30 years of research into the genetic basis of aging. Their studies have shown that an innovative approach called caloric restriction is validated by science as an important key to understanding the preservation of youth. I like that they but they address the actual sources of aging. I’d like to try the AgeLOC Transforming Night. I need the Agefloc transforming night. Now! I would love to try the AGELOC™ TRANSFORMING NIGHT cream! I learned that they have spent more than 30 years researching the science behind this! For ONE more bonus entry, follow The WiC Project on Twitter and/or “Like” The WiC Project on Facebook. For ONE bonus entry, subscribe to The WiC Project via email and leave comment letting me know you have. ageloC™ Transforming Night looks like it would be awesome. I would most like to try the AGELOC™ TRANSFORMING NIGHT. I like the fact that Nu Skin Ageloc focuses just on anti aging products and not a variety of other skin products. i just gives me the comfort that they are truly focused on their research. Our first global product offering under the ageLOC brand, the ageLOC skin care products, launched at Nu Skin’s global convention in October 2009. In the fall of 2010, we will launch our first ageLOC nutrition product in some of our markets, with a global nutritional product offering slated for global convention in October 2011. The company has been around for 26 years. I see the company has been around over 26 years. I learned that Nu Skin is able to identify critical arSuperMarkers called Youth Gene Clusters, which are functional groups of genes that regulate how we appear to age. Only ageLOC ’s proprietary science understands how to reset these Youth Gene Clusters to their youthful patterns of activity. I would love to try AGELOC Future Serum to help combat my aging skin. I learned that Dr. Richard Weindruch and Dr. Tomas Prolla, Nu Skin has access to more than 30 years of research into the genetic basis of aging. I am following The Wic Project on Twitter as lyndsey1stunna. I like that dermatologist approved and not animal tested. I would like to try ageloC Transforming Night sounds nice. I would like to try the ageLOC Gentle Cleanse & Tone because I’m always looking for a good cleanser that will both purify and moisturize my face. Nu Skin’s exclusive ageLOC science targets these arSuperMarkers—the ultimate sources of aging that can influence how we age. I would love to try ageloC™ Radiant Day SPF 22 moisturizer that offers UVA and UVB sun protection. I like that the products are not tested on animals. I’d like to try the AgeLoc Future Serum. It looks great! I want to try the ageLOC™ Future Serum. I learned that this company has been around for 26 years! Besides Transformation, I want to try the Future Serum. I’d love to try the ageloC™ Transforming Night product. 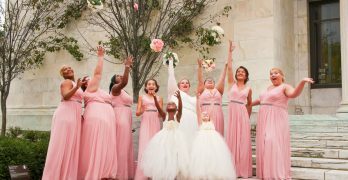 Liked your FB page- Quanda.